Nothing in life is guaranteed, especially life itself or the amount of time we are given here on earth. The best we can do is appreciate our time together and make every encounter as special as possible. Hawks, Honkers & Hoots, like every organization that has the pleasure of working with living creatures share the pain of loss of an Ambassador that has served us so well. Our journey together was so very special. Together we impacted many lives through beauty, knowledge and laughter but you are no longer physically with us. We will forever miss you and appreciate your willingness to be such a wonderful part of our lives. Your spirits are undying and will be with us until we meet again. Clicky was what we called our "Steady Eddy", he had accumulated the most presentations in his short time with us and was a crowd favorite. Clicky came to HH&H from the Lindsay Wildlife Museum in Walnut Creek, CA, in December 2012. He had been found as a young bird by hikers, who rescued him from mobbing crows and ravens, and took him to Lindsay for treatment. 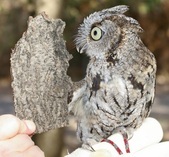 During pre-release flight training, his caretakers noted that he could not gain height or sustain flight well enough to hunt and survive in the wild. They concluded, sadly, that he was non-releasable but had a wonderful life with Hawks, Honkers & Hoots. 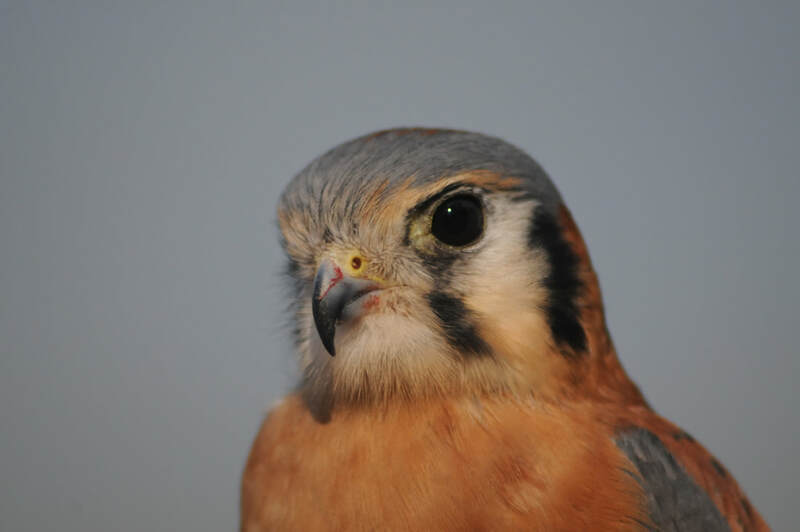 Hover was a handsome American Kestrel who joined HH&H as an Education Ambassador in August 2014. He was a male, as identified by his striking blue-grey coloring on his wings and head. Hover was imprinted on humans, meaning that he did not know he was a Kestrel and would behave in a very un-bird-like manner in the wild. Hover's favorite food was a fat mealworm, but he liked mice and the occasional quail bits. He was quite the communicator, chattering every time we'd come near him. We continued to work with Hover to make him feel comfortable in his role as an Education Ambassador. Hover's outgoing personality and interest in people made him very special. 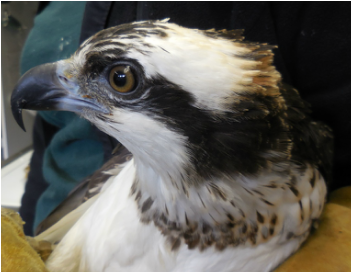 Osprey are well known for being difficult to rehabilitate let alone tame down to become Education Ambassadors. We knew Phoenix was special and wanted her to blaze trails for other Osprey and that she did. We were very dedicated to working with Phoenix to get her comfortable in her role as an Education Ambassador and she became a SUPERSTAR in a short time! She loved to be on the glove and seemed to be interested people who came to see her. 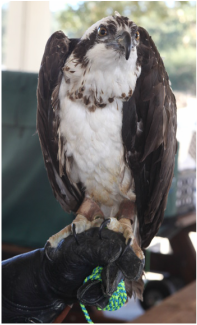 Phoenix was a beautiful Osprey who joined HH&H in November 2014. Phoenix, who used to be called Singe, was rescued from a fire with her two sibblings by Wildlife Images in Merlin, Oregon. She suffered damage to her wings and feathers and lost her ability to fly with ease. She found herself a permanent home and rose from the ashes! Phoenix loved salmon and trout. Her most favorite thing to do was to tear the lips off her fish! We will truly miss her! Turbo came to us a youngster, he was stolen from his nest when he was just a little guy. Someone was hand raising him but was forfeited to USFWS. He was unable to be returned to the wild since he had already imprinted to humans. We were so very fortunate to have spent some really special times with him. Turbo often showed his love for people and was so willing to learn new things, it's no wonder that he was a crowd favorite. We all shared a special bond with him that will be cherished forever. We love and miss you every day Turbo!